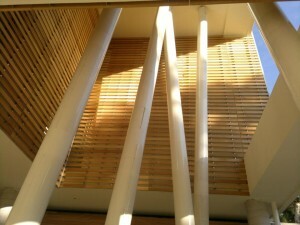 The shading panel or brise soleil in wood is made with horizontal slats to create a shielding effect from sunlight . For aesthetic requirements , or to create special architectural elements, which are improperly calledvertical sun can be made of vertical screens or panels . 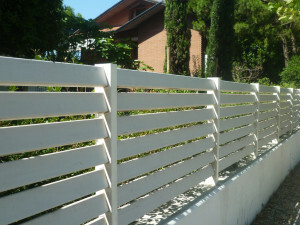 In fact lay the planks vertically does not help to shield the sunlight and shade the environment, but has a purpose purely decorative and ornamental, which can still be requested and implemented according to specific needs , both in the grids and in the choice of their orientation. The applications of horizontal brise soleil, and minimally vertical ones , mainly on building facades and exterior walls , railings and parapets , shelters or pergolas , gazebos and solarium or outdoors. Based on your location and your use of the Horizontal or vertical shading , you decide the type of wood to use and what material the structure is more suitable for the purpose . Is in fact taking place the use of an innovative material called COR-TEN , a steel with low content of alloy elements but with high mechanical strength , which does not undergo corrosion by atmospheric agents and maintains the particular rust-colored . It is precisely the coloring which makes it very suitable also in the realization of architectural and design elements , specifically is usable both for the staves that for the structure of the sunblind . The realization of facades and walls with vertical horizontal or vertical sun , made ​​after a careful study design , where engineers work together with the study of architecture and develop customized product . After making the realization of which takes place in the carpentry department of the company , the materials can be packaged in special mounting boxes where there are the slats , the load-bearing structure and the supports to be positioned on the wall . The kit comprises is sent directly to the construction site where it can be easily mounted by non-experts . However Albero Maestro makes available , to trips throughout Italy , its layers experienced team , to meet the specific needs of installation.